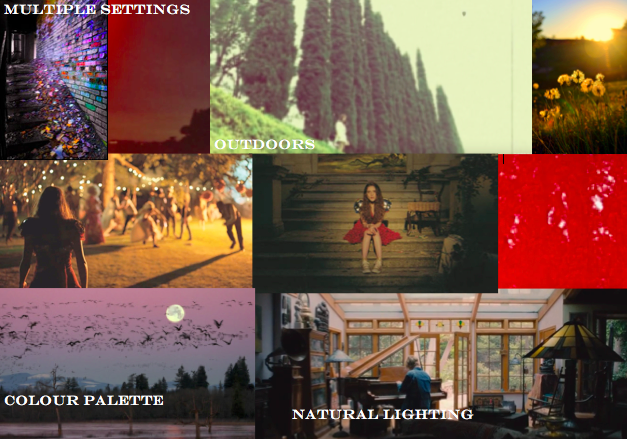 The genre of my music video is indie pop and the mood board I have created reflects this. I want to and think it is important for my video to mainly be based in the outdoors. Having a central colour that runs throughout is a good way of keeping up the films consistency. The colour red is one I would like to focus on with hues of it running through the lighting, costumes and set. Usually in indie pop videos the singer is the main actor within the video and the narrative follows them. I want to use a variety of locations to show a journey and it is common for indie pop videos to explore multiple settings. I want to keep my video quite light and airy and by using open spaces and outdoor areas this will hopefully be possible. The indie pop music genre, is often about being original and telling either a story or using symbols within your video. This is something I hope to achieve through the flow of my video and by making it reflect the lyrics to a certain extent. Indie pop is quite an experimental genre that allows you to push boundaries so I will use this to my advantage. This genre will allow me to explore different filming and shot techniques. I hope to make my piece individual and original and for it to be seen as a new piece of art rather than a copied piece. The reason I have chosen the images I have for my music video is to represent where and which artists I want to take inspiration from. Othello images such as the one in the top right and the one below represent the types of light I want to use within the video. The shots of the girl represent some of the shots I want to use and the way I want to tie the colour red into not just the lighting but the costumes. Over all the mood board represents the thoughts and inspirations I want to carry forward when creating my own video.